In 2012 a Code of Conduct was introduced for official WordPress events to make WordCamps safer and more inclusive. It is now applied to all WordCamps worldwide and anyone who attends a WordCamp automatically agrees to it. Since the Code of Conduct was first introduced, the community has grown and diversified. 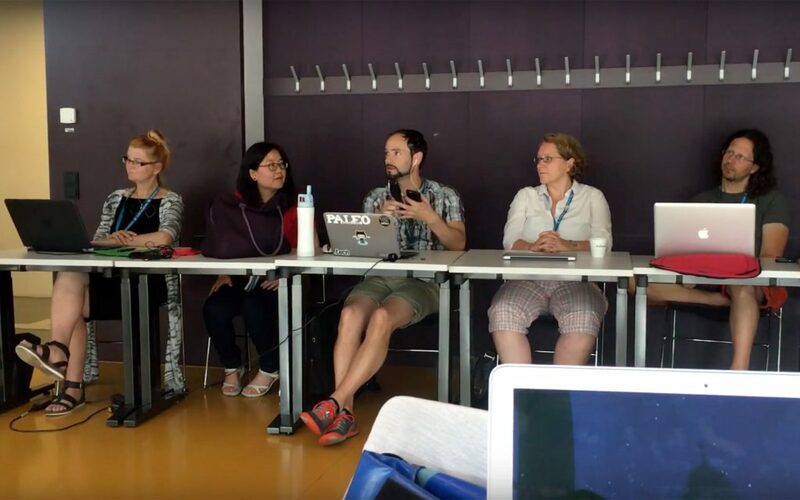 At the 2015 Community Summit, a group discussed expanding the scope of the WordCamp Code of Conduct to apply to the WordPress community as a whole. Work on such a Community Code of Conduct has been ongoing since early 2013, and a ticket was created in 2015, but no finalized version has ever been presented to the community and ratified. The WordCamp Code of Conduct has been active for 5 years as a tool to promote the safety and inclusion of all community members at WordCamps world wide. The Community Conduct Project aims to expand the scope of the Code of Conduct to promote the same values of safety and inclusion in all official community spaces including WordCamps, WordPress Meetups, official fora and websites including comment sections, and official chat channels (specifically Slack and IRC). 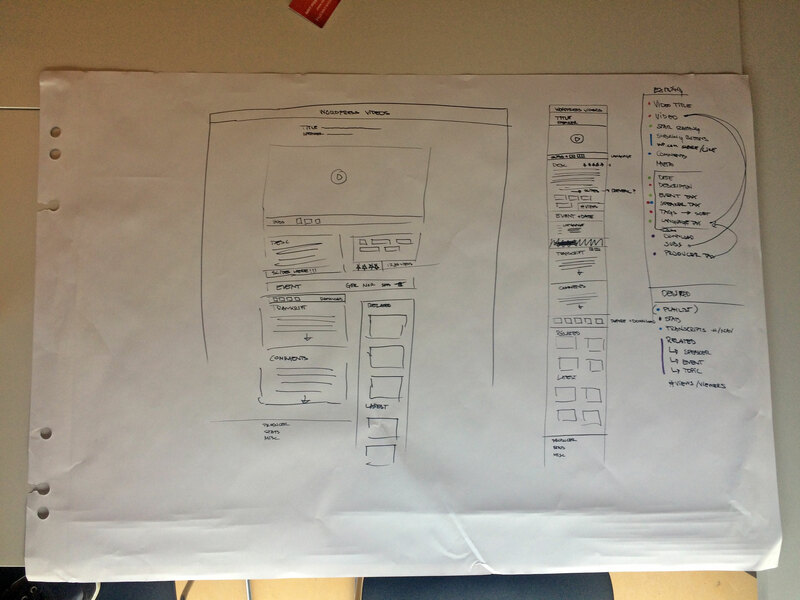 Everything needs a starting point, so this began as a proposal by Jenny Wong and Morten Rand-Hendriksen, and reviewed by various community members. We would like to now take this opportunity to share this project proposal with you all, the amazing WordPress community. We propose a new Community Conduct Project to update the WordCamp Code of Conduct and expand its scope to become a WordPress Community Code of Conduct (CCoC). b) create a system for reporting, handling, and resolution of CCoC-related issues as they arise. Who can be called a “WordPress Community Member”? In what spaces does the CCoC apply? Under what circumstances can a person be considered to be acting as a community member? What values and ideals would a CCOC protect? Based on these values and ideals, what is the baseline assumption a person can expect whilst being in a WP space. What spaces, physical or virtual, are considered “community spaces” in which all members can be expected to promote and/or adhere to these values and ideals and any agreed upon community guidelines derived from them? The answers to these questions will help inform the process of drafting a new CCoC, a system for reporting, handling, and resolving issues, which will become the enforcement procedures based on WordPress community values. Phase 1: Community review and input on the existing Code of Conduct including a survey for the community to participate in. Phase 2: Review and categorize feedback. Phase 3: Draft a revised Code of Conduct based on feedback from Phases 1 and 2. The first task of the project will be to gather data about the current Code of Conduct. As a starting point, we have prepared a draft for a survey to be discussed by the group at the first meeting. This survey will be published publicly to learn more about how the current CoC is used in the real world. Any and all community members are encouraged to provide input and/or join the project, no previous skills or experience required. In particular, we are seeking diverse voices so if you identify as a member of a diverse, underrepresented, or marginalized group you are encouraged to join. All meetings will be conducted in the #community-team Slack channel, and minutes published on the Make Community blog to ensure full transparency using the tag CCOC. Working documents will be available for review by the community throughout the project and these will be linked at the end of each post. If you or someone you know are interested in contributing to this project, please leave a comment below providing a rough ideal time in UTC format, which timezone you are based in and join the #community-team channel. Before scheduling a regular meeting time, we will review the ideal times and timezones of interested community members, to ensure everyone can take part. I wanted to let the team know how everything is going with the WordPress Community Interview Series since we are starting a new year. There have been 35 interviews published since the first 2 on June 16th, 2016. The first few weeks, I was trying to publish 2 interviews per week but it was recommended that I cut back to 1 per week. I quickly agreed because it was very evident that it was going to be difficult to keep that schedule up. I have been able to have 2 or 3 interviews scheduled in advance and at least 1 video interview in reserve in case anything unexpected happens. For the most part the selection for people to be interviewed has been random. I take a look at recent WordCamps, speakers or organizers, Twitter comments, etc. It has worked fairly well. One thing that I want to mention, 2 of the published videos were actually a compilation of short Skype calls that I did during Global WordPress Translation Day 2 on November 12th. Of the 35 interviews, 18 are non US. The map below shows the locations. As far as my setup, it is very simple and easy to use. I use a MacBook Air with either a Audio Technica AR 2100 or a Blue Snowball. Also, I use earbuds to reduce speaker noise back into the mic. I use the Ecamm application with Skype to record the calls. For processing the videos I use Screenflow. This app is not very expensive and fairly easy to use. I had a voiceover done using Fiverr which has worked out great. I can insert text, lower thirds, effects, etc. The Skype calls ‘usually’ last about 15 minutes or so. We talk for a few minutes before I do an introduction just so I get over some nervousness. I am trying to concentrate on cutting out the ummms and ahhhs. The average length is about 10 minutes, although a few have gone almost 20 minutes. I try to follow a loose format of an introduction, talk about WordCamps, the WordPress Community, anything special the guest might be involved in and then wrap up. This has worked well so far. That is pretty much it. If anybody has suggestions, please feel free to comment! Now that we are starting to move videos onto our official WordPress YouTube channel, how should we handle tags? Tags in YT have much more use as navigation that you see in a WordPress site typically, like WPTV. Those are a few off of the top of my head. What say you, if you could set a list of tags for this channel, how would you go about it? What kind of naming conventions would you use for consistency. I have no firm ideas here, so I’d love to hear your thoughts and ideas in the comments. And to keep the list reasonable, try to limit yourself to 10 or less “big tags” we can use on YouTube. For this week (Friday July 15th) our video wrap up post will be focused on recent videos that are of interest to new WordPress users. As with last week, given that WCEU happened recently and is fresh in everyone’s mind, let’s focus on videos from that camp. There are plenty of sessions to choose from and all are great quality, so what is your favorite WCEU session targeted at developers? Let’s feature it on our blog! Just so we are all up-to-date on the camera equipment. This is the current layout for the cases. 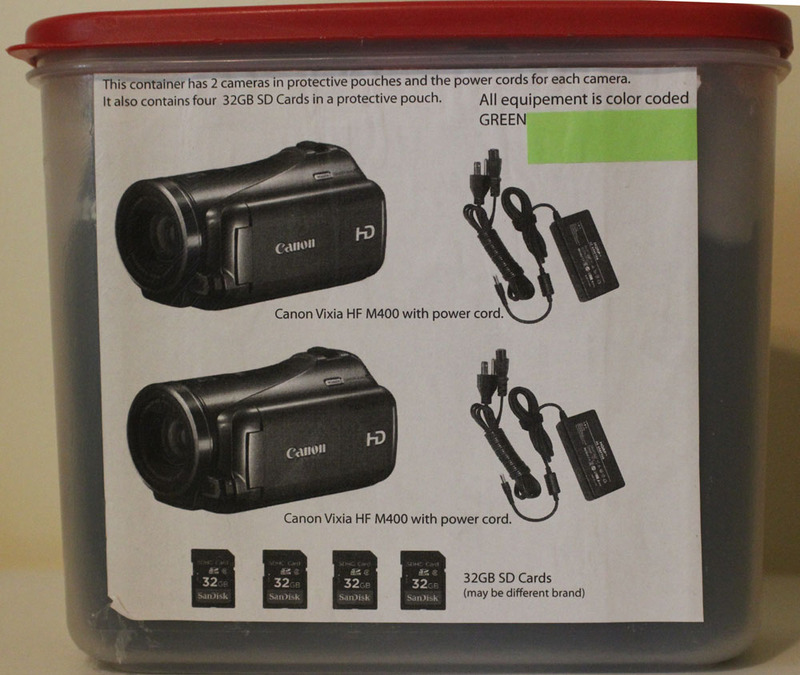 We have some kits that have cameras and equipment for two setups. We also have single camera cases. In each case are containers with pictures and names of the equipment inside. 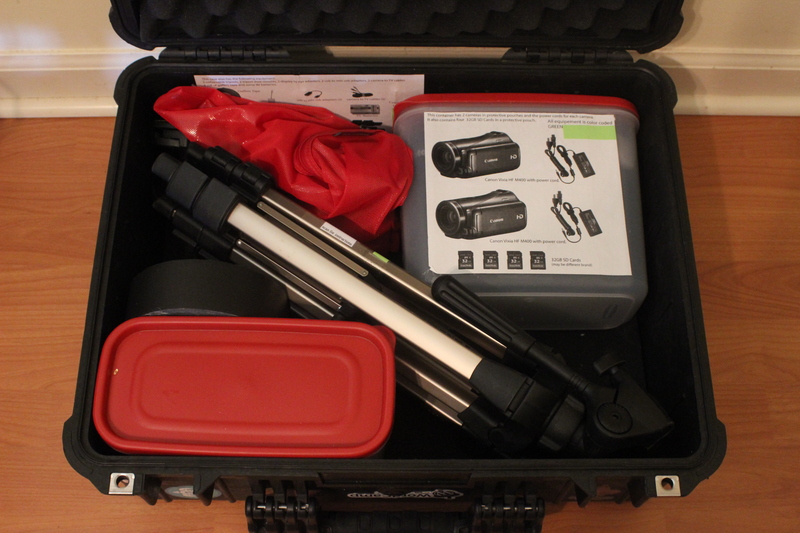 This container has all the camera equipment. and another container has all the audio equipment with names and pictures of the equipment. 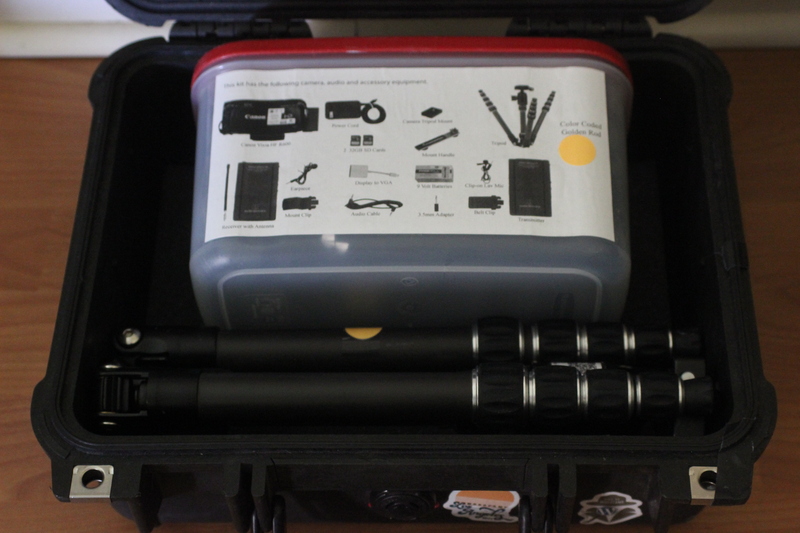 And inside each case is a list with pictures and names of the misc equipment not listed in the other containers. Each case has each piece of equipment, in that case, colored coded to make it easier to get the correct equipment back in the correct case. Examples of color coded equipment. 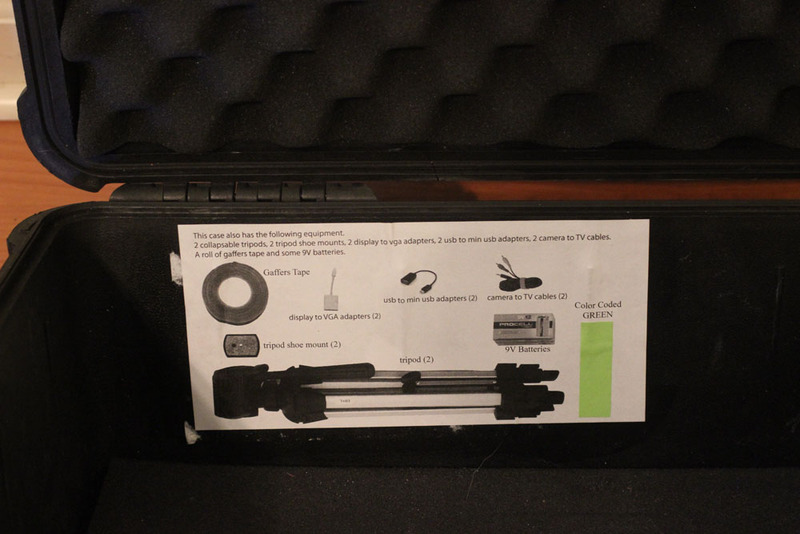 We also have QR codes on the tripods, the handle mounts and the audio transmitter and receivers. Scanning the QR code will show a short video for setting up and using each piece of equipment. 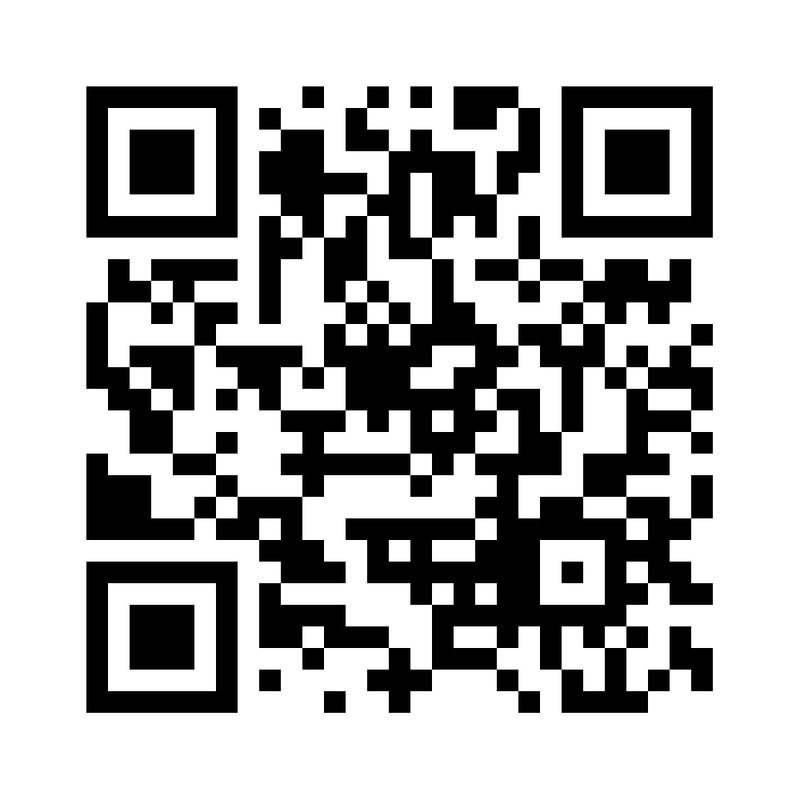 (Scan one and give it a try). 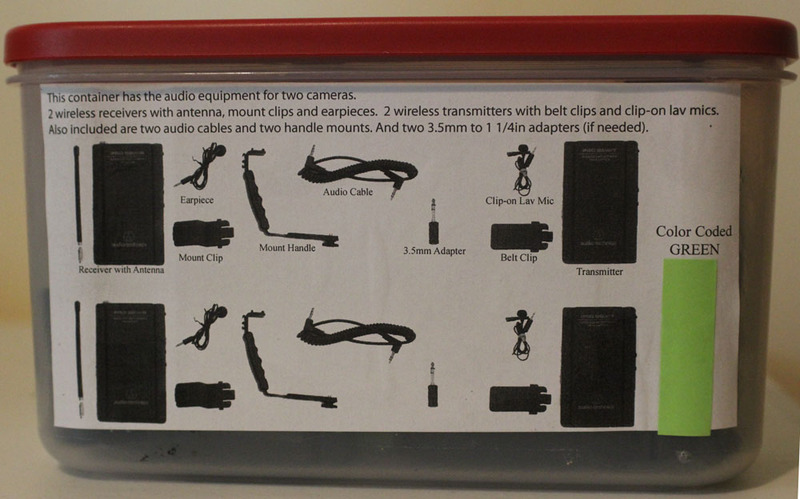 And we have instruction sheets for each of the cameras (with a link to the mfg manual at the bottom of each sheet). We also have Livestream camera equipment but that’s for another post. Captions/Subtitles – New captions submitted by @rianrietveld and @jessicaestes, and it was pointed out we could use a style guide for captions. @jerrysarscastic will add a page for that to the WPTV Moderator Handbook. Want to join our meeting next week? See the blue box at the top of the page to see when our next meeting is! After talking with @jwparky, we decided to swap the days we post on, and the weekly video roundup post will be going out on Fridays now, and the John’s interview posts will be going out on Tuesdays (we’re switching) as this fits both our schedules better. For this week (Friday July 8th) our video wrap up post will be focused on Recent videos that are of interest to new WordPress users. Given that WCEU happened recently and is fresh in everyone’s mind, I thought it’d be cool to focus on new user WordCamp sessions from that camp, so with that in mind, what is your favorite WCEU session targeted at new users? Let’s feature it on our blog for everyone to see! WCEU and WC Antwerp are uploading to AWS. Post Production/Publishing – What videos do we have that need post production work. Are there pending videos in WPTV that need out help in publishing? How can the team help? Subtitling/captioning – do we have new captions to approve this week? New videos that can be captioned? This is a new weekly agenda item. Lots of interest post WCEU, which is great to see. 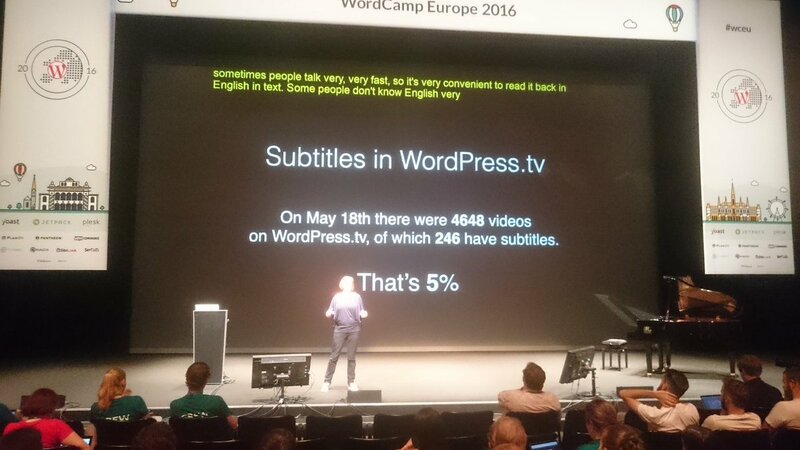 @casiepa mentioned he is willing to work on a script to convert Youtube caption formats to work with WordPress.tv, and also @extraboy brought it up with the community team while at WCEU. Starting out, we will ask captioners (captioneers?) to try and complete captions/subs for two videos this week, and report back about how that went, working toward making this a weekly update on the things we are adding captions to. If you only have time to work on captioning one video a week, even a short one, is fine too. Any help would be great! Below are some notes and stories that I collected with the help of various participants during the WCEU 2016 and the Contributor Day. Thank you all! There were 14 people attending, from 19 signed up to the WPTV team through Contributor Day form. 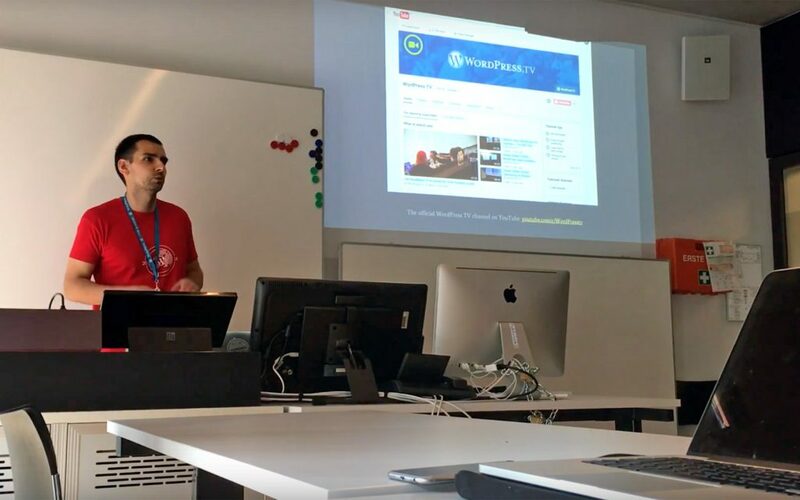 I presented my slides, introducing our WPTV team and explained the workflow of producing and publishing videos for WordPress.tv to all the participants in the room. We discussed the WordPress video hardware and how to be better on setting it up for WordCamp or WordPress Meetup sessions registration. I replied to some questions from Kyung Munneke on WordCamp video/audio management and on where to recruit people for this role. I said to ask for help in the local WordPress Community or local photo/video school and leave the hiring of a video firm as a last resort (this suggestion is also written in the WordCamp Planning Handbook). 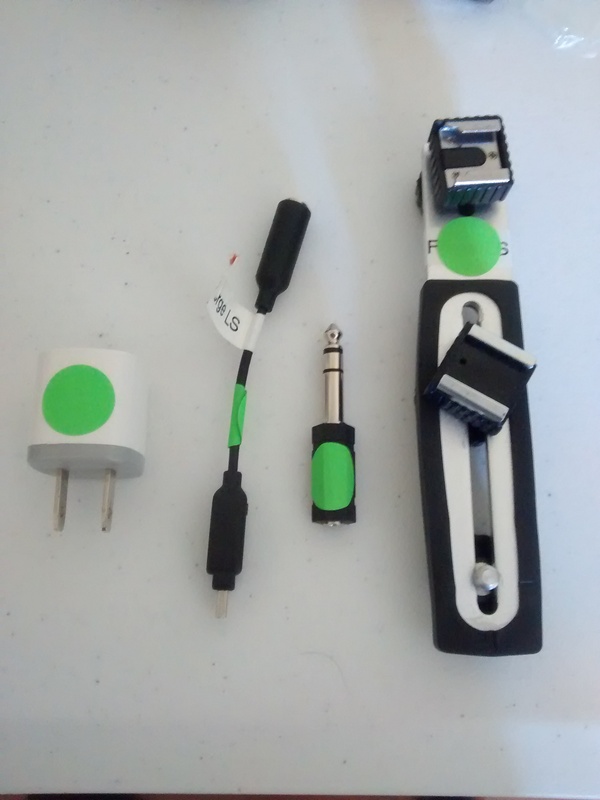 Leo Tulipan asked questions about the audio equipment to use at Meetups and WordCamps and he and Florian Gottschall were also made some recommendations on an external microphone to attach to your mobile device like this RØDE smartLav+ lavalier microphone. My suggestion for a quality audio registration was to use an external recorder like the Zoom H4n or to attach your laptop directly to a mixer and recording inside Audacity open source software. Florian Gottschall (@floriang) illustrated his video editing plugin (wp-video-editor.com), but we can’t use it on WordPress.tv due the WP.com platform limitations on installing plugins. If you want to help our team with the video post-production and don’t have the right software, you could easily use this plugin for post-production of videos from WordCamps directly in your browser. You can upload a logo, add Intro/Outro and the Audio Mastering is done automatically. Afterwards you receive a ready branded video which you can upload to WordPress TV. 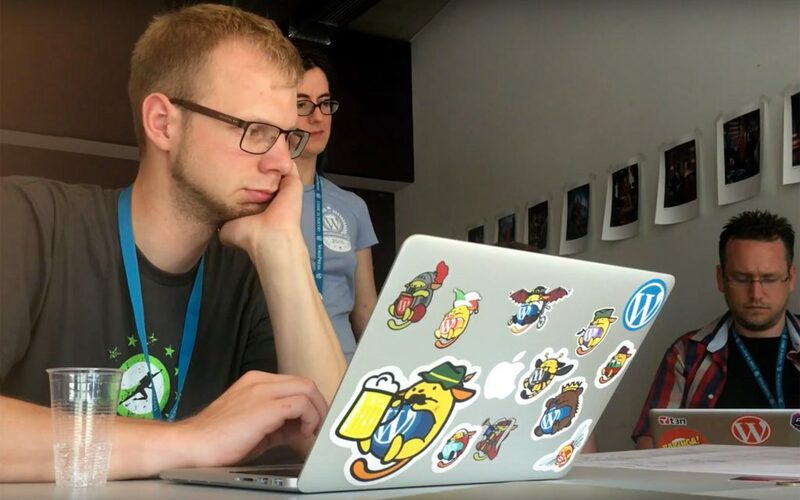 Some good guys from Germany (Sven Wagener, Sören Wrede and Florian Gottschall) shared their WordCamp setup experience, gently offered by German Joomla! association. In this blog post you can find all the setup details. 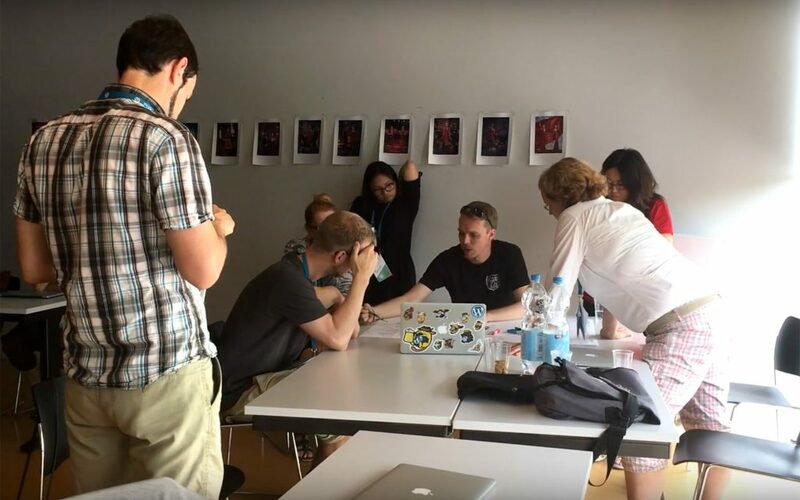 I really enjoyed this story and was impressed on the quality and a speed of the WordCamp Nuremberg 2016 videos appeared on WordPress.tv in one week after the event (definitely at the level of a WCEU or WCUS). Really loved this type of collaboration between tech communities! Morten Rand-Hendriksen (@mor10) pointed out that the actual WordPress.tv structure is limiting the contributions to grow and maybe WPTV should be completely a community project? … and I agree! WordPress.tv is hosted on WordPress.com and using the VideoPress service for all the videos and it’s still an Automattic project. WordPress.tv theme was open sourced in meta-environment 9 months ago but still no changes were made. Morten will provide more info when he comes back from vacation and will join one of our meetings. Some questions were made about why just not using only YouTube and embed videos directly in the content. This makes a lot of sense because now we are making a double work of cross-posting the same videos. Michael (@roseapplemedia) wrote something about this idea here but not exactly the same. Lesley Molecke (@eckandgrumble) was interested in subtitling videos after seen the Rian Rietveld (@rianrietveld) talk on WordPress Accessibility team and this Tweet by @mor10 that made her show up to Contributor Day. The state of subtitles on http://WordPress.tv could use some improvement. Annette Voelckner (@onthisearth) and another person asked about what types of post-production we happen to do and I explained that mainly are the simplest intro & outro placements and the second ones (more difficult) are with slides to cut-in. Before the Contributor Day I had a discussion with @kovshenin on subtitles file formats and if we can use the YouTube formats (.sbv, .srt & .vtt) directly on WordPress.tv, without converting them to a .ttml through the actual complicated process involving Amara web service. At this point, we are also discouraging people to help due to the complicated workflow and for the lack of updated tools at our disposal. The solution? YouTube subtitling system of course! Some general questions on Slack setup and w.org accounts where made and I pointed people to the right direction. Most of the pictures was taken from the video shooted by Florian Gottschall (@floriang) and his team during WCEU 2016. Thanks a lot to Rocío Valdivia (@_dorsvenabili) for pinged me and asked to lead the WordPress TV team at this Contributor Day and to Alex Kirk (@akirk) for tech support during the day. Please, share your thoughts in the comments below and if something is missing from these notes or if I forgot to mention someone please write it. 2. Post Production/Publishing – We are also all caught up on videos pending publication. We also took a bit of time to discuss @oleg‘s proposal to bring more vodcast and interview content onto our site, from existing YT channels. Full post is here if you’d like to comment.